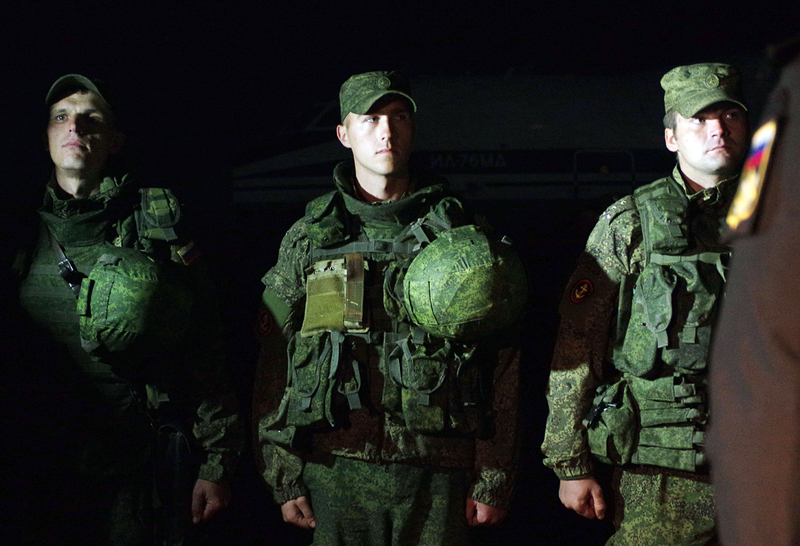 Russia’s Black Sea Fleet marines who arrived after a successful operation guarding the Hmeymim airbase in Syria, on the Belbek airfield near Sevastopol. Cropped image. For the time being, private military companies (PMC) are outlawed in Russia. However, according to sources, the so-called Wagner group, a Russian equivalent of a PMC, has been spotted in Syria. Not far from the base of the 10th Separate Special-Purpose Brigade of the Russian Defense Ministry’s Main Intelligence Directorate (GRU) in the village of Molkino in the Krasnodar Territory, there is a checkpoint manned by guards armed with AK-74s. Beyond the checkpoint, reportedly, lies the camp of a private military company (PMC), says a source at the military unit. There is no information on who owns this land but several neighboring plots are registered as belonging to the territorial division of the defense ministry’s forestry department. The camp started operating approximately in the middle of 2015, say two RBK sources who used to work there. There are barracks, a guard tower, a police dog unit, a training facility and a parking lot on the territory of the camp. The camp’s existence is not being publicized – formally, PMCs are outlawed in Russia. However, the Wagner group’s participation in the Syrian operation could pave the way for the legalization of private military companies in Russia. Under Russian laws, the military can only be employed by the state. Mercenary activity is punishable by a prison term of up to 15 years. However, RBK sources in the Federal Security Service (FSB) and the defense ministry indicate that the Russian authorities have no intention of giving up on the idea of legalizing PMCs. Furthermore, there are private military companies in Russia that operate just like those abroad, despite the fact that there is no law in place to regulate their activity. What can special-purpose Russian troops learn from Siberian Old Believers? These are the kind of “special tasks” carried out in Syria by Major Sergei Chupov, a member of an elite unit who was killed in February 2016, an acquaintance of his told RBK. The RBK source, who knew the serviceman well, claims that the interior ministry forces veteran, who had been through both Chechen campaigns, was in Syria as an employee of a private military company known as the Wagner group. The Russian Defense Ministry dismissed reports about the Wagner group’s operation in Syria that appeared in the Wall Street Journal as an “information attack.” However, sources at the FSB and the defense ministry told RBK that unofficially the Wagner group is supervised by the GRU. The Wagner group first appeared in the Middle East shortly before Russia began to officially deploy its bases in Syria in the fall of 2015, the RBK source at the Defense Ministry said. In 2016, there were from 1,000 to 1,600 Wagner employees simultaneously present in Syria, says a source familiar with the operation. According to RBK sources familiar with the details of the operation, Russia’s main losses in Syria were sustained by PMCs. The sources offer differing estimates of losses. A defense ministry official insists that a total of 27 “private servicemen” were killed in the Middle East, whereas a former PMC officer puts the figure at no fewer than 100. Runaway Russian intelligence agent dies in the U.S.
RBK contacted the family of one of the killed PMC fighters but they refused to talk to the media. A Wagner group officer explained that non-disclosure is a prerequisite for the families to get compensation. The standard compensation for the family of a killed PMC employee is up to 5 million rubles (about $80,000 at the current exchange rate), the source said. PMC fighters played a major part in recapturing the historical part of the city of Palmyra from ISIS forces, says a former officer with the group. According to him, the Wagner group is being used mainly for carrying out offensives in difficult areas, making it possible to reduce losses among regular troops in Syria. It is not quite accurate to describe the Wagner group as a private military company, another market source pointed out. “That group’s goal is not to make money, it is not a business,” he said. In the case of the Wagner group, the interests of the state, which required forces to tackle sensitive tasks in Syria, coincided with the desire of a group of servicemen to make some money while performing tasks in the interests of the country, said an RBK source close to the FSB leadership. “The benefit offered by PMCs is that they can be used abroad, when the use of regular troops is not very appropriate,” said Alexander Khramchikhin, deputy head of the Moscow-based Institute of Political and Military Analysis. A similar reasoning was given by Deputy Prime Minister Dmitry Rogozin, who supervises the military-defense complex, in the fall of 2012: “We are thinking whether our money will be used to finance foreign private military companies or whether we shall consider the expediency of setting up companies like that inside Russia and make a step in that direction,” he said. Yet while the operation of private military companies remains illegal in Russia, the defense ministry is considering transferring mercenaries from the Wagner group from Russian territory to Tajikistan, Nagorny Karabakh or Abkhazia, says RBC’s source in the FSB. The source is convinced that the PMC will not be disbanded as it has proven its effectiveness. Authors: Ilya Rozhdestvensky, Anton Bayev, Polina Rusyayeva. Yelizaveta Surnacheva contributed to this article. First published in Russian by RBC Magazine.